As part of our centennial celebrations of Nelson Mandela, Mayibuye Südafrika Community e.V. had the proud and unique opportunity of hosting Prof. Zimitri Erasmus of Wits University in Johannesburg. She delivered an inspiring lecture about Race in Post 1994 South Africa to a very enthusiastic and interested audience. Prof. Erasmus is a consummate academic who treats the issue of race with the utmost sensitivity and sincerity it deserves. In her lecture she concentrated on two ways of how race is articulated in South Africa and Euro-North America today. 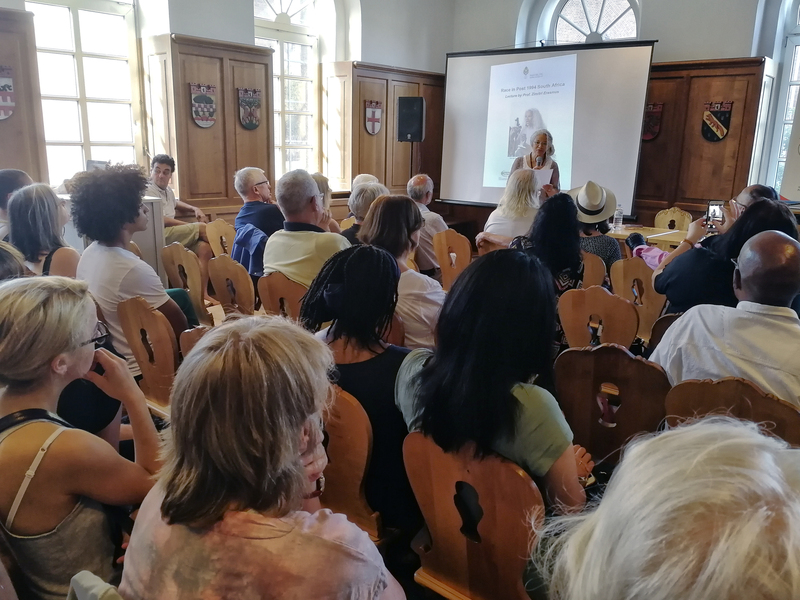 She explained that although race classifications were abolished by the apartheid regime in 1991, the current democratic government continues to use these categories. Examples of the continued use of these race classifications can be found in the manifold forms people had to complete. On these forms persons had to indicate to which “race” (Black, African, Coloured, Indian, White and Other) group they belonged. Those who refuse to do so are automatically given a particular category by the official in charge. In other words, one could be registered into a completely different race category to what one was used to, based on the official’s prerogative of what he/she sees, which includes one’s name and surname. It is telling that in the current South African situation the category “Other” has quite the opposite meaning to that of the apartheid era. Then it meant not “white”. Erasmus underlined the point that the continuous use of these apartheid race categories by today’s government is for a different purpose – to redress inequality. She pointed out though that it would be “naive to assume that simply dropping race categories from all official documentation will provide a magic wand to address centuries of oppression and inequality”. But she hastily added that to use this method to redress inequality without taking class formation in South Africa into consideration is equally naive. Furthermore, she suggested alternatives to the continued use of race classifications. For example, what about asking the following questions: “Were your parents eligible to vote before 1994?” and “Did you have transport to take you to and from school?” By framing the questions in that way, you automatically turn away from racially classifying people. According to Erasmus’ analysis, the Euro-North American articulation of race is based on a scientistic framework. This framework looks at “population categories”, “the percentage of so-called black and so-called white blood in one’s veins”, the degree of “sameness and difference in human DNA”, and “cultural difference/diversity”. To add weight to her search for an alternative, Prof. Erasmus draws on the work of the anti- colonial Black scholar and intellectual, Sylvia Wynter, who uses the concept of humanism/ humaning as opposed to the concept of race. In her exposition, Erasmus explained how Sylvia Wynter lays bare how the Christian European man conceived himself as the “human being”. In that scheme the African and other colonized peoples resemble the non-being. Wynter argues that although we can claim to be all part of the human race, we however have different lived experiences. For her, it is futile for the colonized people to strive to become like the Christian man. Instead, we should strive to become human or what she called the process of humaning. The way Prof. Erasmus conducted her lecture created an atmosphere of feeling at ease. One automatically became part of her articulation of the issues involved. She listened attentively to each and every question and responded in a manner that deepened the understanding of the audience. It was a privilege to have been part of the audience.